If you've been following along at home, you already know what feels like an endless onslaught of rain here in Durham has drastically reduced my grilling efforts as of late, and as a result of that, I'm pulling recipes from a collection of items from the past that were left to be forgotten for one reason or another. 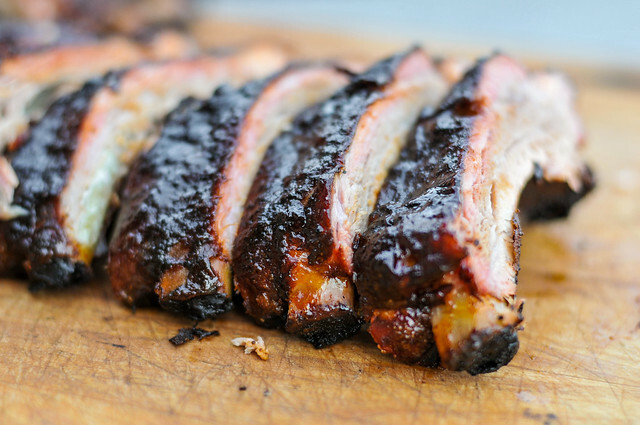 This recipe for cherry-sauced ribs was taken from there, originally cooked in 2011 and let sit since then not for any flaw in the recipe—in fact, these were among some of the tastiest of ribs I've made—but because I thought the sauce recipe was so good that I was going to hold onto it as one of my "secrets." Well, last summer I decided to hell with it and released my cherry-chipotle barbecue sauce recipe out into the wild, so there really was no reason to hold the resulting rib recipe any longer, and it just so happens the right rainy day to do so finally arrived. After fifteen years of doing the Meatwave, it's kind of invigorating to make something that truly amazes me. This happened over this past season with these Philadelphia Roast Pork Sandwiches. 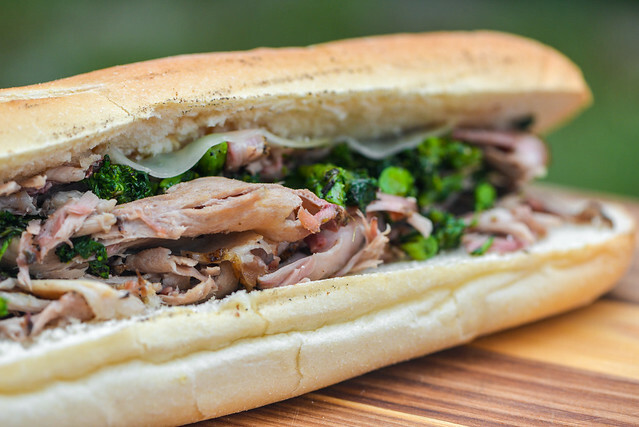 While I will personally always be partial to a cheesesteak, I know this "second" sandwich of Philly is the superior specimen with its amazingly flavorful pork that's enhanced by bitter broccoli rabe and sharp provolone. It's one truly powerful and memorable sandwich, and when I set out to make it at Mid-Atlantic themed cookout, I figured it would probably be on par with my pulled pork, but this pork shoulder blew my standard barbecue away and is what I consider to be my crowning achievement of what ended up being a season filled with many meaty hits. Last summer I accomplished what I considered a grand achievement—getting incredibly crisp and crackling pork skin with tender and juicy meat all on the grill. I did that via an all belly porchetta, and that dish left me with a strong desire to keep churning out similar recipes. 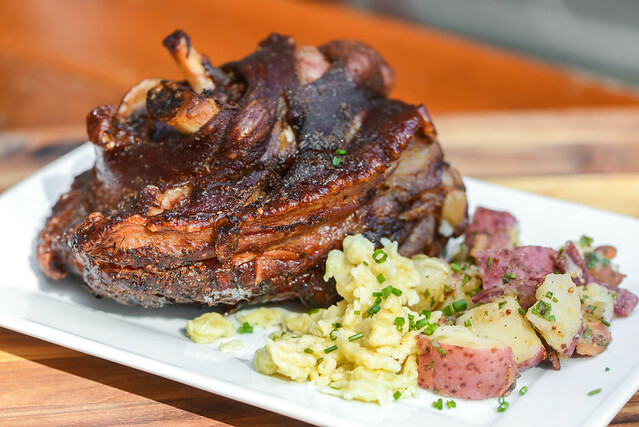 With Oktoberfest upon us, I found one such porcine item by way of German Schweinshaxe—crispy pork knuckles. My kitchen is stocked to the point where I really don't need to add anything to accomplish just about any task I want to. This can be frustrating for someone who likes new toys like myself, and it's really just a waiting game until something breaks or outlives its usefulness to be able to replace it and be able to purchase new and improved model. This happened recently to my old mandoline, whose feet broke off in a way that was not fixable and rendered it unsafe for use. That mandoline put in about 10 years of great service, but the thought of replacing it left me more excited for the new than sad about the lost of the past. I went straight into research mode and after some time, settled on an OXO brand mandoline that seemed to strike the perfect balance of features, positive reviews, and value and went out and bought it post haste. 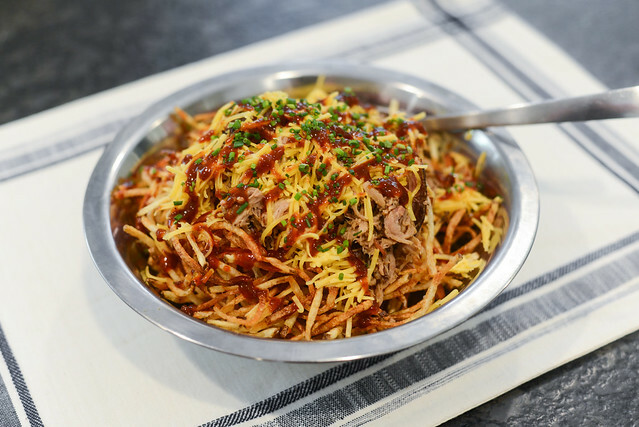 One of those new features for me was a shoestring slicing option, and it didn't take me too long to make use of it when I decided I needed these pulled pork fries in my life. To date, I've shared almost everything I've made—at least all recipes worthy of sharing—just as I made them so you can hopefully grill and smoke up dishes that come out exactly how they did for me. The only thing I've held back on are my exact recipes for the sauces and I rubs I used in competition, and at one point, even considered bottling and selling. I have not done any comps in a long time and have no plans to sell my stuff, so I don't really see a reason to guard these few recipes any longer. 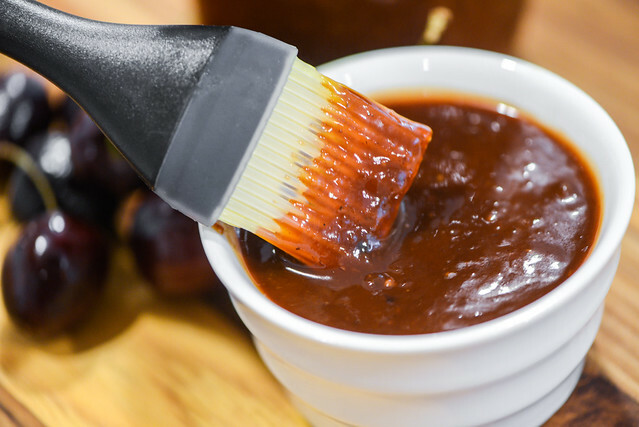 So to release one such item from the vault, I decided to share my cherry-chipotle barbecue sauce, which is a sauce that's equally delicious and unique, making it something you likely won't find on grocery shelves and should definitely try out at home.